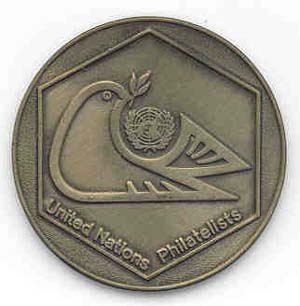 UNPI Medals & Ribbons UNPI medals in Gold, Silver and Bronze hues are available to be presented to any exhibit of eligible material based on philatelic merit. Membership in UNPI is NOT required. Exhibits may be either multi-frame or single-frame. At the UNPI annual convention there is no limit to the number of medals at each level that may be presented. Otherwise, at national, regional and local shows in the United States and Canada one set of medals and ribbons (1 each Gold, Silver and Bronze) will be provided to shows with at least three qualifying exhibits. Ribbons corresponding to the medal levels are to be posted at the frames. UNPI President's Award This award (Blue acrylic obelisk) is presented to the best exhibit of eligible material by a member of the UNPI at its annual convention. The exhibit may be either a multi-frame exhibit or a single-frame exhibit. The UNPI President's Award cannot be won more than once by the same exhibit. 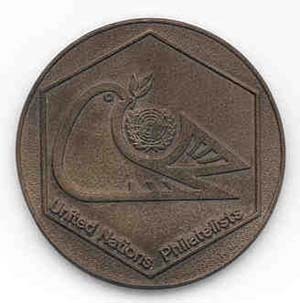 Eligible Material Exhibits of the stamps, postal stationary, postal history, etc. 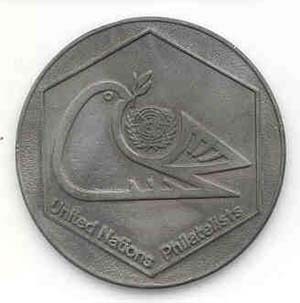 of the United Nations, its predecessor, The League of Nations, or any of the specialized agencies affiliated with either group are eligible for UNPI awards. This includes Thematic and Display exhibits of topics pertaining to the organizations described above. Medals and ribbons may be requested from the UNPI Exhibits Chair, Tony Dewey, by writing to him at 157 Warrenton Avenue, Hartford, CT 06105-3931, or via e-mail at afdewey@sbcglobal.net.